Massage is offered by length of service and any of the above techniques can be combined or customized. Mobile Massage outside 15 miles includes a mileage charge of $.35/mile in the cost. **Monthly memberships and Gift Cards are available. I am a credentialed ART provider, but not a chiropractor or physical therapist. Although my certification is in massage therapy, I can assist in insurance reimbursement for therapeutic soft tissue work, but payment is due a the time of service. I can give you an invoice with the treatment code for Manual Therapy, but it will require a diagnosis code from a primary care physician - and the approval and referral from your doctor and/or chiropractor. You can check with the claims adjuster from your insurance company to see about reimbursement. ©2015, The Koda Body Therapy. All rights reserved. The most common type of massage in the United States. It is a system of long strokes, kneading, friction, percussion and vibration that can range from very light (relaxation only) to very deep (deep tissue). Oils and lotions are present to reduce the amount of friction on the skin. Additional stretches and strengthening exercises may be incorporated to help the client increase flexibility, alleviate muscle imbalance and decrease pain. Heated basalt stones are placed on or used different parts of the body during the massage. They transfer heat in the massage itself through the hands or placement. The heat of the stones helps muscles relax, increases blood flow and calms the body into a deeper relaxation. When combined with aromatherapy or essential oils (arnica), the stones can provide a very general deep relaxing massage or they can be used for deeper more specific work to relieve muscle pain and spasms. We can provide On-Site Chair Massages that relieve tension, relax the mind and leave everyone ready to work. If you are looking to lift spirits and building good will? Want to attract crowds and leave a lasting impression at your event? If your shoulders feel like they are up to your ears, your back is tense, and your arms are heavy - but there is no time for a full body massage, then consider a chair massage. Let our extensive team of Certified and Nationally licensed massage therapists take the stress out of bringing Chair Massage to your office or event. Chair Massages are a guaranteed way to bring a positive atmosphere to any company event or add a Corporate Wellness Program. Reducing work-related issues such as poor posture, carpal tunnel symptoms, reducing stress and increasing low employee energy can be key factors to productivity. We have specifically designed chairs with comfortable support for the face, arms, legs and torso. The chair allows you to relax and massage the neck, head, shoulders, back, arms and hands (in ONLY 10-15 minutes). A chair massage can dramatically reduce tension and increase a feeling of physical relaxation and mental renewal. This is a gentle, hands-on approach to focus the bodywork on the skeletal system - and in addition the muscular attachments. The attachments of the Cranial Sacral area are comprised of the tissue and bones of the cranium, the spine and the pelvis, and the work is used to detect areas of restriction and imbalance. This light and very delicate manual touch and techniques are used to release problems in the physical structure and relieve undo pressure on the brain and spinal chord - it is more like 'holds' that gently encourage tension to release. This therapy helps alleviate a range of problems, including: migraines & tension headaches, chronic neck and back pain and chronic fatigue and fibromyalgia. More specifically useful in post-surgery and spinal work - where deeper work tends to increase pain. This is a structured, interactive approach to manual therapy that considers the nervous system of the patient from skin cell to sense of self. Techniques are slow, light, kind, intelligent, responsive and effective. Positioning of limbs and trunk affects deeper nerve trunks and is combined with skin stretch directed toward cutaneous fields of nerves that branch outward into skin. This form of bodywork is based on acupressure points and zone theory, and it involves working with thumbs and fingers on reflex points in the hands, feet and ears. By massaging these reflex points, it is possible to treat different areas of the body, since each area corresponds to specific zones of the body. This technique can be used to address ill-health, illness prevention and maintain good circulation. Utilizes Swedish massage techniques, and may include Deep Tissue, Myofascial Release, Trigger Point therapies. Our sports massage is tailored to every athlete and their respective sport and session goals. Sports massage is designed to help an athlete warm up or cool down (before, during or after) an event. It aids in the body's regeneration, recovery and prevents injury during rigorous workouts or competition. Please ask about 'pre-post-workout' or PT and Chiropractic sessions, so that can set-up a time with our massage therapist before you leave to go home. Take full advantage of 'training' your muscles to relax, the bodywork will optimize your workouts. This therapeutic massage technique combines Swedish and Deep tissue techniques to deliver benefits of both massages, based on the need of each specific location of the body. The therapist will start with lighter pressure to warm the superficial muscle layers and progress to the deepest levels of the pressure allowed by the body. This work depends on the clients tolerance levels. Deep Tissue massage helps alleviate chronic muscle pain and injury muscle using slow strokes, direct pressure, or friction directed across the director of the muscle fiber. This therapeutic massage is specifically designed to alleviate the source of pain through cycles of isolated pressure and deep tissue work (20 minutes per muscle). It combines high-intensity manual techniques with the Swedish relaxation. In this work, the client actively participates in identifying the source of the pain, deep breathing and stretching. In General the combination of 'more active' techniques in MFR/MFT and static 'pressure' provides the greatest results and benefits. Trigger Point or Myofascial Release can be felt after just one visit, but it not for the faint of heart. The massage activity is just the start of releases for muscles areas that are constricted thus alleviating pain. 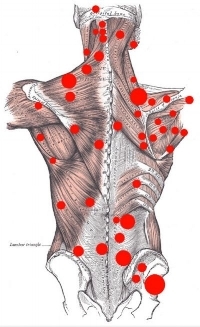 You may also have unique symptoms for Trigger Points so feel free to refer to www.triggerpoints.net identify your particular symptoms. Releasing muscles after workout is a good way to avoid Trigger Points.